This new policy brief, published by the URG and the Commonwealth secretariat, is the second in a new series of URG publications exploring how universal human rights standards are translated, through the actions of governments, parliaments, national human rights institutions and NGOs, in some cases with the support of development partners, into on-the-ground improvements in the enjoyment of human rights. This second report explores the role of parliaments. A recent trend in the long-standing debate over the role of parliaments in the international human rights system has been a growing focus on their role in supporting and overseeing the domestic implementation of international human rights obligations and commitments. As part of a wider global ‘human rights implementation agenda,’ the IPU, the UN and the Commonwealth have each taken steps to assert the role of parliaments, especially parliamentary human rights committees, in a systemic manner throughout the international human rights ‘implementation-reporting cycle.’ This means leveraging parliaments’ legislative, oversight and budgetary roles to support the effective domestic implementation of the recommendations of the UN’s human rights mechanisms, the transparent monitoring of progress, and objective and balanced international reporting. 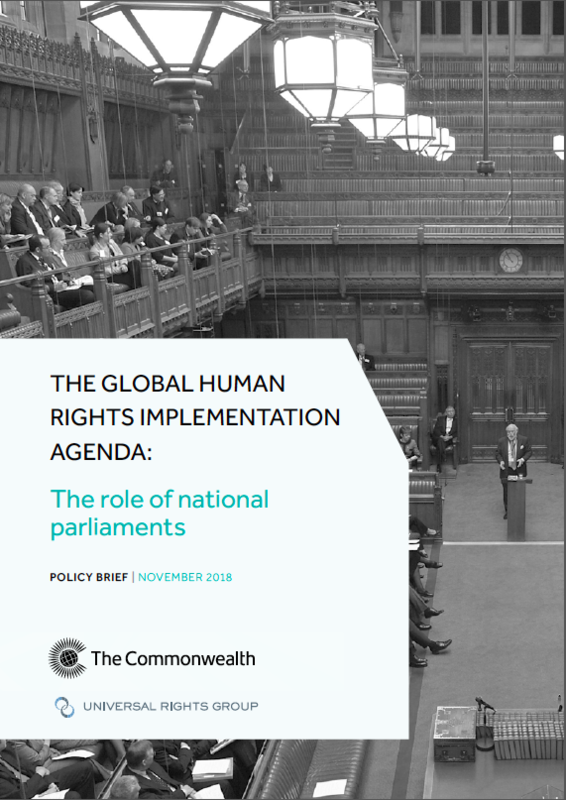 The new URG-Commonwealth Secretariat policy brief seeks to map and analyse contemporary debates, decisions and initiatives focused on parliamentary engagement with the universal human rights system, and to assess the contribution of the Commonwealth to worldwide efforts to strengthen that engagement and thereby improve the on-the-ground enjoyment of human rights. In order to do so, the report looks at current efforts at the UN to strengthen the implementation of human rights recommendations and the realisation of human rights norms, and how parliaments are being positioned as key stakeholders in those efforts. It then addresses the contribution of Commonwealth parliaments to that wider movement, including through the development of declarations of principle; the establishment of parliamentary human rights committees, caucuses, associations and networks; and the exchange of good practices between Commonwealth legislatures.